Intraday plays can offer exceptional opportunities for not only capturing quick moves, but also for managing risk by avoiding the overnight gap risk. 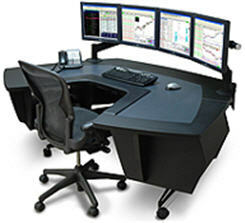 It’s a timeframe which full-time traders often participate in, but one which the part-time trader often avoids due to a perceived inability to manage the trade effectively. With today’s trading technologies available to us all, there’s no longer an excuse for missing out on moves when away from your screens. The bracket order is a well-known device for the set-it-and-forget-it type of trade, but there are aspects of it which few utilize. I’ve realized through helping so many part-time traders who desire to capture some intraday moves that it’s common to simply think inside the box. Most of them view a bracket order as an entry, a stop, and a limit order (set at the target). That’s not at all a bad way to do it, and in fact it’s exactly how I use brackets on my swing trades . For day trades and the bracket order, a little creativity can go a long way. Mix up the parameters from the usual bracket order you use and throw in a couple of different variables. One of your stop choices is the trailing stop, which can be excellent for intraday trading. This order allows you to designate either a percentage or a price amount which the stock would have to retreat from its best level (since the trade was entered) in order to trigger a closing order. For the trader seeking to grab as much of an intraday trend as possible, this is a great option to have available – particularly in momentum names which have the ability to keep running. Another choice which can be made is the time stop for managing exits. This order is based on the clock, so once a given time of day is reached, the next action can be triggered (sell!). Since the whole idea of a day trade is to capture intraday movement and not hold overnight, consider setting a time-triggered order to exit the position ahead of the closing bell. The bottom-line lesson is this: even as a part-time trader, you can still participate in some intraday moves. Use the technology which is at your disposal, and think outside the box a bit. It can help you manage risk effectively, and if the trade works you can lock in some solid profits – without sitting at your desk!